CDB is a "full service" integrated dizziness clinic, and we have four types of expert providers - physicians, audiologists, and physical therapists, and a visual therapist. We diagnose dizziness due to ear problems, brain (neurological) problems, eye problems, blood pressure fluctuations, and many other causes. Most of our patients have already seen several other doctors and come to us to get things sorted out or for a more sophisticated treatment protocol than is commonly available. Nearly all of the diagnostic testing is accomplished at the clinic (except for MRI or CT scans). 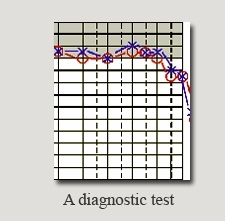 Details of the diagnostic procedures that we offer is found here. CDH has seen more than 20,000 patients between 1990 and 2017. The most common conditions that we diagnose at CDH include the following. We treat the conditions that we diagnose. Our physicians, the two board-certified neurologists, provide medical management including drug treatment, and referrals to surgeons should surgery be thought advisable. The following lists the main disorders that are treated at the clinic. Each type of treatment follows a protocol. 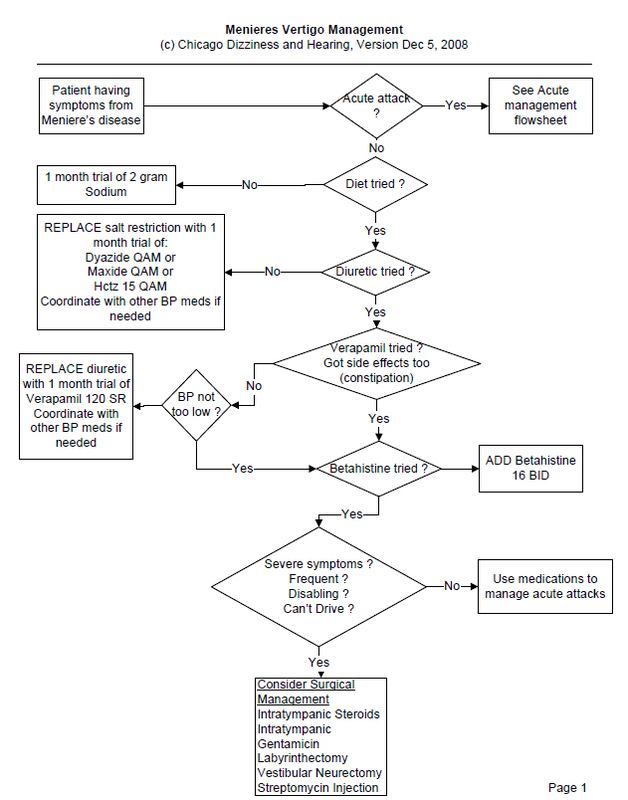 An example of our treatment protocol for Menieres Disease Algorithm is shown in the flowchart below. In addition to performing standard diagnostic testing for hearing issues, such as audiometry, our audiologists also a very full menu of vestibular diagnostic services (such as rotatory chair, VEMP testing, ECOG testing, VHIT). Hearing aids services are not provided in the clinic. For tinnitus, (see Tinnitus algorithm) we offer a diagnostic and management program including medication, masking, and referrals for psychotherapy such as CBT when appropriate. Our physical therapists administer treatments for BPPV as well as other types of dizziness amenable to rehabilitation, such as bilateral vestibular loss. They also provide some unusual types of physical therapy including treatment for motion sickness including mal de debarquement syndrome, and tilt-training for orthostatic hypotension. Vestibular rehabilitation - physical therapy for dizziness is a very important part of our practice. We have two outstanding and experienced physical therapists. If you have a definitive diagnosis of BPPV and a referral, we encourage you to schedule with one of our PTs for speed, although of course a physician will also see you briefly. PT appointments are often available within a day or two. For BPPV, the typical number of appointments is 2 (initial, a followup). Complicated situations, of course, may take more appointments. Visual vertigo evaluation and treatment. In 2017, we added a specialist in visual vertigo to CDH. Dr. Sorensen, trained at the Illinois College of Optometry, evaluates persons who have dizziness mainly provoked by visual input -- for example, persons who have problems with walking down supermarket aisles. For persons who have eye problems on her evaluation, she may direct them to get new glasses, contacts, or start them on therapy. CDH does not sell glasses frames or contacts, but there are many stores within a block radius of the clinic, including one in the same building, where one's prescription can be filled.